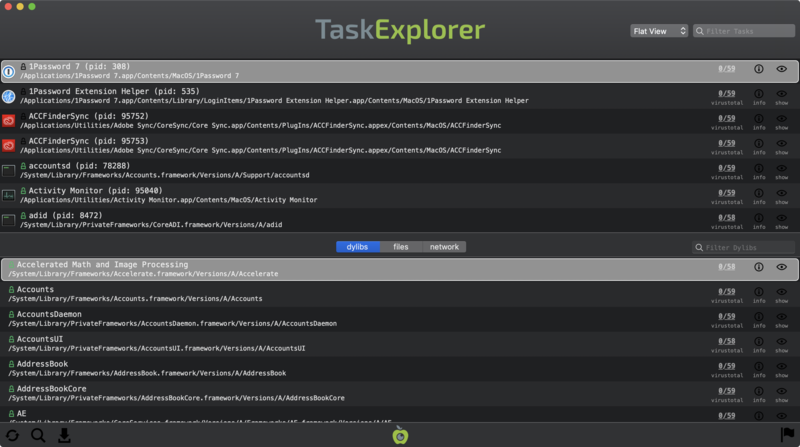 Explore all the tasks (processes) running on your Mac with TaskExplorer. Quickly see a task's signature status, loaded dylibs, open files, network connection, and much more! quickly search to find specific items, or unsigned binaries, established network connections, and more! To run the application and begin exploring tasks, simply double click on 'TaskExplorer.app' The first time TaskExplorer is run, it will display an authorization prompt in order to gain necessary privileges. These privileges are required so that TaskExplorer can enumerate information about remote processes (such as loaded dylibs). Tasks can be filtered using the 'Filter Tasks' search box, found at the top right corner of the app. Simply begin typing to filter all tasks based on their names, paths or pids. For example, typing 'Chrome' will show only tasks that contain 'Chrome' in their name or path. TaskExplorer also contains special 'hash-tag' filters that can filter tasks based on concepts such as 'all non-Apple (3rd-party) tasks' or 'all unsigned tasks' (see the 'Search and Filtering' section below for details). Each row the top task pane, contains the icon, name, process id (pid), and path of the task. 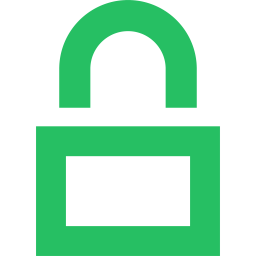 A lock icon next to the task's name, indicates whether the task belongs to Apple, , or a 3rd-party (but still signed) , or is unsigned . On the right-hand side of each task's row are various informational and actionable buttons. These buttons provide information about item's VirusTotal (anti-virus) scan results, general information about the task, and the ability to view the item in Finder. Task explorer automatically queries VirusTotal with a hash of the binary in order to retrieve any information. While VirusTotal is being queried, this button displays '■ ■ ■'. Once the query is complete, the title of the button is automatically updated with either the detection ratio, or a '?' if the binary is not known to VirusTotal. With the query complete, the button can be clicked to reveal a popup containing VirusTotal-specific information about the file. If the file is unknown, clicking the 'submit?' button will submit the file for analysis. Known files contain a link to the full analysis report and a 'rescan?' button that will rescan the file. If known malware is detected, the item's name and VirusTotal button will be highlighted in red. Clicking on the final button ('show') in the task's row, will show the task's binary in a Finder window. The bottom pane can display the selected task's dylibs, open files, or network connections. Simply toggle the segment control to change what is shown. The layout of the items in the bottom pane is fairly similar to the top (tasks') pane. For example, executable binaries will display a VirusTotal detection ratio, and each item (regardless of category), has an 'info' button that can be clicked to display more information about the selected item (dylib, file, or network connection). Similarly, the items can be filtered by the filter/search box found directory above the lower pane. While any item category (dylib, file, or network connection) can be filtered by simply typing in the field, the certain 'hash-tag' search filters (e.g #nonapple) only apply to executable binaries, and thus are only relevant when the bottom pane is displaying dylibs. The next section, 'Search and Filtering' provides more details on this. TaskExplorer (as of version 2.0), can be run via the commandline. There are various benefits to this, including the ability to programmatically enumerate or scan all running tasks and dynamic libraries. Note that TaskExplorer, when run from the commandline, must be executed as root (or via sudo). Q: Why is TaskExplorer asking me to enter my password? A: In order to gather information about system tasks (such as commandline arguments and loaded dylibs), the operating system requires TaskExplorer execute with elevated privileges.